For me, it's often the little things at Burning Man that touch me the most. It's the understated art quietly sitting all alone on the playa that can really wow me. Like this piece I stumbled upon on one of my early morning bike rides. It immediately made me think of one of those emergency highway call boxes. Etched on one door is "IN CASE:" and the other is "A UKE." "IN CASE: A UKE"... It is an emergency call box but instead of a phone, it had three ukuleles inside! Check out that logo. It might be hard to see, but the little ukulele has a tiny "emergency cross." Love it! I did a little digging and learned the artist is Justin Lange, a creative technologist from Brooklyn. He received a grant from Burning Man to produce it. What if our public infrastructure was built to respond to the emotional needs and inner crises of its citizens? 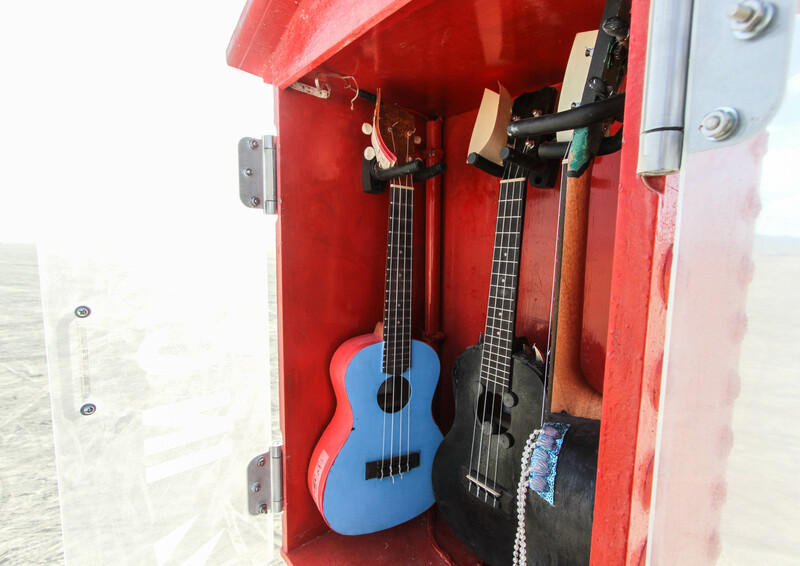 Distributed throughout the playa are a few highly visible red cabinets modeled and finished in the style of pre-war, cast-iron emergency call boxes that provide immediate ukulele access. For me, it's all about surprise and delight when it comes to playa art and "IN CASE: A UKE" really hit that mark for me. Thanks, Justin!